BIRMINGHAM, Alabama -- Banking industry analyst Richard X. Bove said Thursday that shares of Regions Financial Corp. are undervalued and that the metro-area's largest private sector employer is set to grow after four years without an annual profit. Bove, of Rochdale Securities, said in a research report that his company's new ratings system sets Birmingham-based Regions at "undervalued," which equates to "buy" under the old system. Bove said he expects shares to reach 75 percent of book value or $8 a share, down from an earlier estimate of $9.50. Despite the cut in the target price, Bove said the employer of 6,000 people in the metro area is on the right track. "The bank has money once again to put into capital spending," Bove wrote, noting the repayment of $3.5 billion of investment under the Troubled Assets Relief Program and the $1.2 billion sale of brokerage Morgan Keegan. "It is, therefore, improving its technology both to cut operating costs and also to offer new distribution systems to the consumer." Also Thursday, Regions was ranked 16th on the SNL Financial list of Top 50 U.S. banks during the first quarter, unchanged from the fourth quarter, with $125 billion of assets. The company operates about 1,700 branches in 16 states and claims a metro-area deposit share of 38 percent. </arrow>San Francisco-based Wells Fargo & Co., at No. 4. The successor to Wachovia Corp. has $1.3 trillion of assets and a 13 percent deposit market share in Birmingham, good for third-place behind No. 1 Regions and No. 2 BBVA Compass. </arrow>Pittsburgh-based PNC Financial Services, at No. 9. PNC bought North Carolina's RBC Bank this year, gaining 17 branches in the metro area. PNC now ranks seventh in Birmingham, with 2.6 percent deposit share. </arrow>Winston-Salem-based BB&T Corp. rated 13th on the SNL Financial list, with $175 billion of assets. In Birmingham, BB&T ranks fifth in deposit share, with 3.7 percent. The company entered Birmingham in 2009 after a government-brokered takeover of bankrupt Colonial Bank. </arrow>BBVA U.S. Bancshares at No. 28 in assets on the SNL list, with $65 billion. The holding company is based in Houston, but the 710-branch banking subsidiary BBVA Compass is based in Birmingham, where it has a second-place deposit share of 15 percent. </arrow>Columbus, Ga.-based Synovus Financial Corp., at No. 40, with $27 billion in assets. The company operates First Commercial Bank in Birmingham, which has a 6 percent metro-area deposit share. Shares of KRA traded higher by 1.83% or $0.35/share to $19.50. NYSE is trading at a price to book ratio of 1.13. This indicates that the shares are relatively cheap compared to book value which means the market is pricing in going concern value. The PEG is 0.6 suggesting that the shares are trading at an excellent value relative to firm's growth rate. The price to sales ratio came in at 0.41. Hence, the firm is extremely cheap relative to its top line sales figures. On average, 394383 shares of KRA exchange hands on a given day and today's volume is recorded at 157757. These financial metrics combined make this company seem undervalued. Value investors may have an eye on this one, especially if the stock gets cheaper. Kraton Performance Polymers, Inc. (Kraton) is a global producer of styrenic block copolymers (SBCs) and other engineered polymers. As focused on last week and early this week, a panic low was registered last Friday after NFP (in FX and gold). 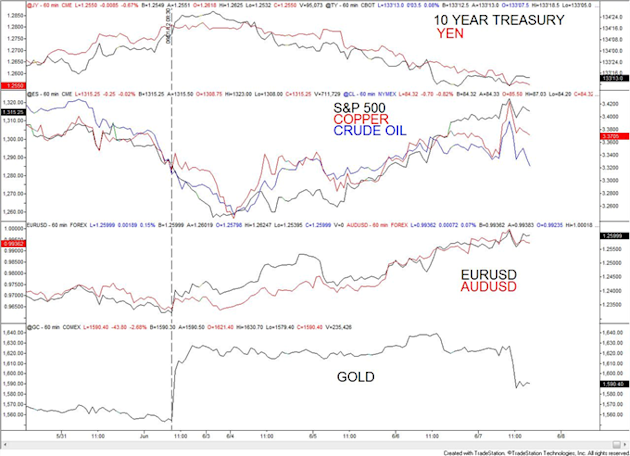 Copper and equities got the message on Monday and Crude followed finally bottomed on Tuesday. Interestingly, gold (one of the leaders at the recent low) was the first to roll over (see the Daily Technicals for more on gold and other markets’ specific patterns and levels) and equities are at resistance. The S&P gap higher into resistance on heavy volume and subsequent reversal this morning was a thing of beauty. It’s good to be bearish at resistance but wave structure and market internals (NYSE statistics) demand that we respect potential for a rally similar to the one that we just endured later in June, albeit from lower levels. Want to learn more about this stuff? Come to next week’s Bootcamp. In the current environment of central bank printing, and specifically USD printing, markets ebb and flow with the expansion and contraction of USD denominated credit. That’s all. The Russell has come back to test the neckline of a well formed head and shoulders top. The decline from the March top was a 5 wave affair and we should therefore expect 3 waves higher from Monday’s low throughout June. The implications from the current juncture are for weakness but probably in a choppy manner (see wave 4). 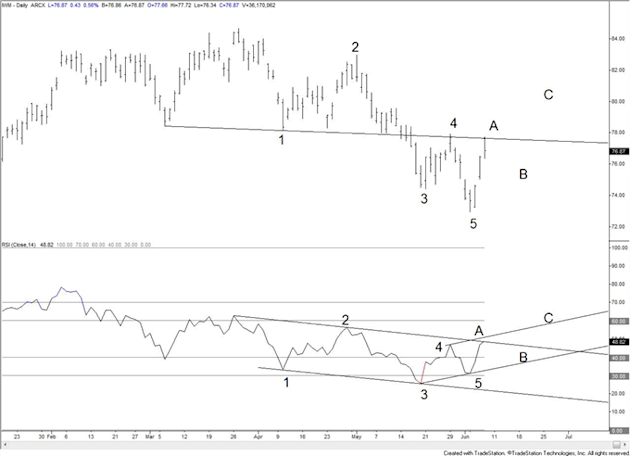 Expect this B wave correction to consume the rest of this week and probably next week. The labels on RSI correspond to waves in price of course but the characteristics of the indicator, such as the wave 3 extreme and divergence with wave 5, suggest that our interpretation is correct. No need to go through the wave count explanation because it’s the same as the Russell but I wanted to provide these levels for risk management purposes. 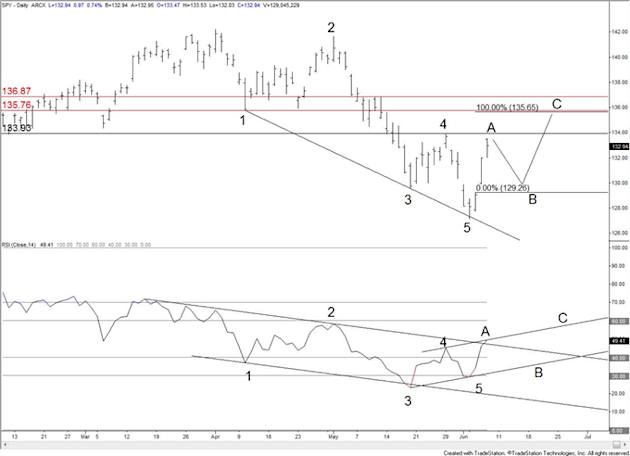 Ultimately, wave B might bottom near the gap left open from yesterday at 129.26. 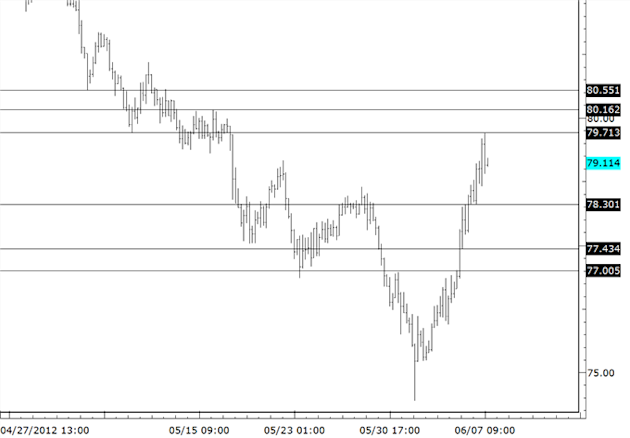 The 61.8% retracement of the rally from Monday’s low is at 129.58 and the 5/21 low is 129.55. It’s interesting to note that if today was the top of wave A (seems likely given the volume during the first hour of trading) and if wave B bottoms near the suggested level, then the rally from Monday’s low would compose 2 equal legs at the April low. I’ve shown the SPY ETF rather than the index because I wanted to highlight the gaps but corresponding index levels are noted. How do use this information to trade FX? You’ve already seen that everything is correlated so be bearish at resistance and bullish at support. We are at resistance now. There are many candidates to trade, including any combination of EUR, AUD / USD, JPY. AUDJPY (or NZDJPY) is the highest beta play (most risk). Price pattern (form) is the primary consideration but secondary considerations such as volume and breadth (NYSE advancing issues and decline issues) help in determining if the interpretation of form is correct. 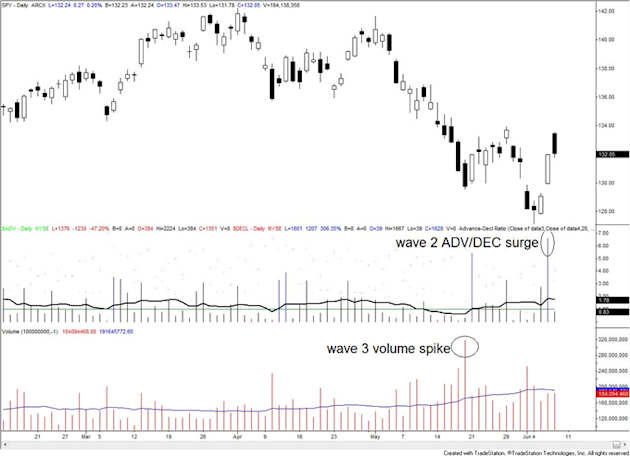 In this case, the volume spike on 5/18 is consistent with labeling that day as wave 3. The surge in breadth on 6/6 is consistent with the beginning of a larger (next degree) 2nd wave advance. The interpretation of wave structure in risk at the current juncture is bearish but probably for just a partial retracement of the advance off of the low. The best expression of risk in the FX market is the AUDJPY, which reversed in the area of former congestion today. Resistance extends to 8055 in the event of another pop but downside risk outweighs upside risk in the short term. 7770-7830 serves as support over the next 1-2 days but 7700 is probably stronger support next week. Naperville, IL -- (SBWIRE) -- 06/07/2012 -- Kellogg Company Profile, SWOT & Financial Report contains in depth information and data about the company and its operations. The profile contains a company overview, key employees, business description, competitive benchmarking, SWOT analysis, key facts, information on products and services, details of locations and subsidiaries, plus information on key news events affecting the company. Kellogg Company Profile, SWOT & Financial Report is a crucial resource for industry executives and anyone looking to access key information about "Kellogg Company"
Kellogg SWOT & Financial report utilizes a wide range of primary and secondary sources, which are analyzed and presented in a consistent and easily accessible format. Canadean strictly follows a standardized research methodology to ensure high levels of data quality and these characteristics guarantee a unique report. - Examines and identifies key information and issues about "Kellogg Company" for business intelligence requirements. - Quickly enhance your understanding of "Kellogg Company"
Kellogg Company (Kellogg) is a manufacturer and marketer of ready-to-eat cereals and convenience foods. Its major products are cookies, crackers, toaster pastries, cereal bars, fruit snacks, frozen waffles and veggie foods. The company offers its products under various brands such as Kellogg's, Keebler, Pop-Tarts, Eggo, Cheez-It, Nutri-Grain, Rice Krispies, Morningstar Farms, Famous Amos, Special K, Stretch Island, All-Bran, Frosted Mini-Wheats, Club and Kashi. It principally operates in the US and the UK markets. Kellogg's products are manufactured in 18 countries and marketed in more than 180 countries across the world. The company also market cookies, crackers and other convenience foods, under brands such as Kellogg's, Keebler, Cheez-It, Murray, Austin and Famous Amos, to supermarkets in the US through a direct store-door (DSD) delivery system and other distribution methods. Kellogg is headquartered in Battle Creek, Michigan, US. BURLINGAME, CA, Jun 07, 2012 (MARKETWIRE via COMTEX) -- Carver Federal Savings Bank is leading the next generation of banking by providing financial services not traditionally offered by banks. By partnering with Nexxo Financial Corporation, Carver is adding four user-friendly kiosks at ATMs around New York City where underbanked consumers can access alternative financial services conveniently and affordably. Nexxo developed this technology to bring a full range of services together in one unique bank-in-a-box kiosk. "Carver is redefining banking by launching a suite of product and services through Carver Community Cash, allowing more of our community residents who have been marginalized to enter or re-enter the banking system. Our goal is to meet the immediate needs of community residents, while providing financial education, access to savings, credit, and other traditional financial services. Our partnership with Nexxo provides Carver an additional delivery channel, giving us more access into our communities," said Deborah C.
Wright, Chairman and CEO of Carver Federal Savings Bank. About Nexxo Founded in 2003, Nexxo is the leader in self-serve financial solutions. Its Everyday Financial Services Platform (EFS) offers a unified, customer-centric solution that seamlessly handles multiple products (check cashing, money transfer, bill pay, money orders, prepaid card servicing, and phone minute top-ups) and multiple channels (self-serve kiosk, teller-assisted desktop, and via mobile phone). With more than four million transactions and $1 billion processed, Nexxo's technology has been proven at hundreds of field locations. Nexxo offers its turn-key financial solutions and service applications to an expanding network of retail partners, domestic and international banks, and financial service providers. For more information, visit nexxofinancial.com.